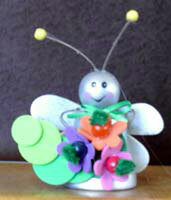 This little clay pot dragonfly is so adorable and fun to make. Even the kids love to make them and they are very easy. You may have to help them with the cutting. Paint the clay pot and the head a silver color. Let dry completely and then paint the face. This is where is gets fun because you can make your clay pot dragonfly have any kind of expression that you want. I made mine a smiley face. With your scissors, cut out the round circles from your foam sheets. Cut about 5 of them from small to large. Also cut out some wings for behind him. Cut out 3 flower petals any size you want them. Glue your pipe stems into the hole on top of the head and glue 2 small beads on the end of each pipe cleaner. Glue the wings on the back and then glue the round circles to the front. Attach one pipe cleaner to each side of the top of the pot behind the head. Glue your flowers on the front in any design that you like. Attach your beads in the middle of the flowers and then make a small bow and glue it on. You can use any colors you like on the dragonfly. Bright colors seem to make him a very happy clay pot dragonfly. There are so many animals you can make with terra cotta pots. Just use your imagination. Just take your time and your creativity will show through your own designs. Have fun making your own clay pot crafts! !